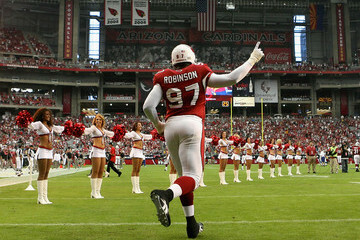 The Cardinals re-signed 13-year veteran DT Bryan Robinson Wednesday to a one-year deal. 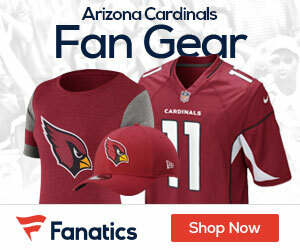 Robinson started at nose tackle the past two years for the Cardinals, but will be used as a defensive end in 2010 with Gabe Watson and first round pick Dan Williams battling for playing time at NT. Robinson made decent use of his opportunity to play in 2009. He compiled 17 solo tackles in 421 snaps for a 4.03% tackle/snap percentage. Robinson was right in the middle of the pack as a run stopper. Robinson, however, was a well below average pass rusher, though he did get one sack. The veteran definitely doesn’t have the stuff to play every down. He’ll likely spell Calais Campbell and Darnell Docket on passing downs. Regular Season Numbers in 2009: 1.0 sack; 4 QB pressures; 0 QB hits; 17 solo tackles; 11 assists; 4 batted passes. Best Performance in 2009: Week 10 against Seattle: 1.0 sack; 1 tackle; 2 assists.